In a press release on November 1st, Pfizer, one of the world's Biggest Pharma companies, announced it was scrapping its high-profile experimental cholesterol drug bococizumab. "not likely to provide value to patients, physicians, or shareholders." In plain English, this means it doesn't work and that investors couldn't make money from it. 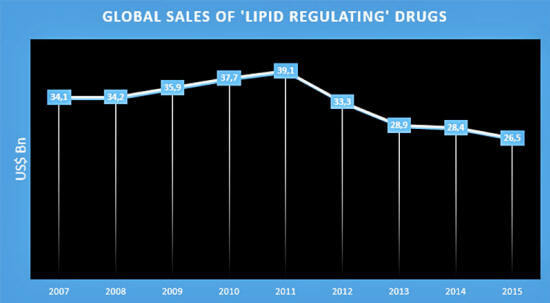 With global sales of statins and other so-called 'lipid regulators' having now fallen more than 32% over the past 5 years, the announcement provides further evidence that the pharma industry's multibillion dollar 'cholesterol bubble' has burst. Only a few years ago, everything in the 'cholesterol garden' seemed rosy for the Pharma Cartel. By 2011, global sales of statins and other lipid-regulating drugs had reached a dizzying new high of 39.1 billion dollars a year. At that time, with statins functioning as the pharma industry's "goldmine", Pfizer's Lipitor was the world's top-selling drug with annual sales of over 12 billion dollars. Lawsuits were filed against Pfizer after it was found that Lipitor may increase the risk of developing diabetes, severe muscle pain, and other serious health problems. 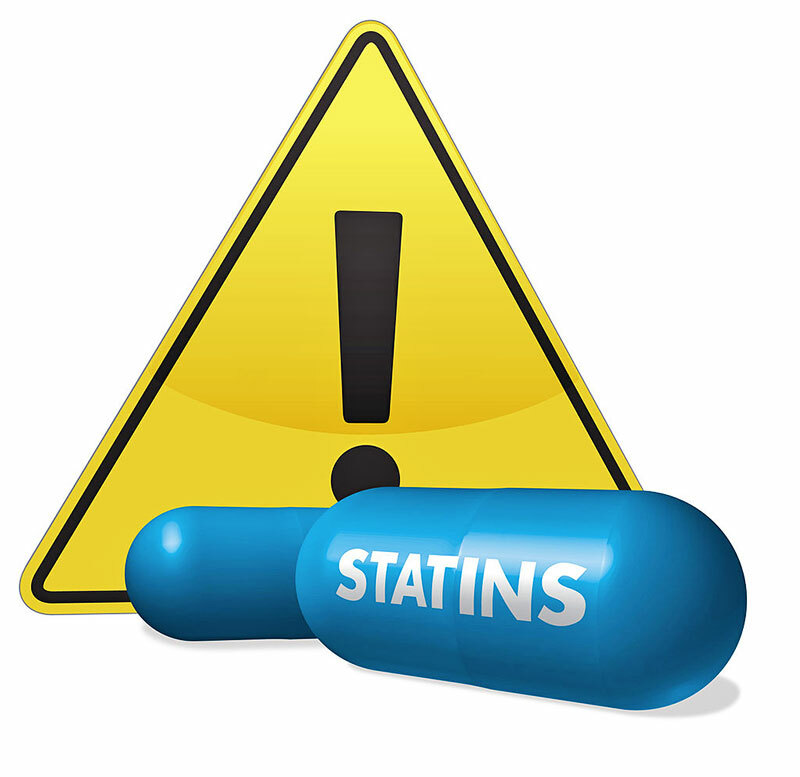 AstraZeneca, the manufacturers of Crestor, another statin, also had lawsuits filed against it by patients who had suffered side effects. From the global highpoint in 2011, sales of statins and other lipid-regulators subsequently fell every single year. By 2015 they had plummeted to 26.5 billion dollars, a fall of over 32%. With drug patents expiring and a growing worldwide awareness of the dangers of statins, this downward trend seems set to continue. Far from being an undesirable substance, however, the fact is that cholesterol is actually essential to our bodies. A structural constituent of the walls of billions of cells, it is the precursor of important biological molecules such as vitamin D and the hormones estrogen and testosterone. Moreover, so long as blood vessel walls are structurally intact, there is no scientific evidence that cholesterol, even at moderately elevated levels, damages them or causes atherosclerotic plaques and heart attacks. To have a damaging effect on otherwise intact blood vessel walls in test animals, cholesterol must be artificially increased to levels essentially never observed in humans. Significantly, therefore, with skepticism about the cholesterol theory of heart disease growing even among orthodox cardiologists, researchers were said to have been "stunned" earlier this year to learn that evacetrapib, a new cholesterol-lowering drug produced by Eli Lilly, did not reduce the risk of either heart attacks, strokes, or death. As the ongoing cholesterol drug failures therefore remind us, in order to successfully control heart disease it is essential that we correctly identify its root cause. 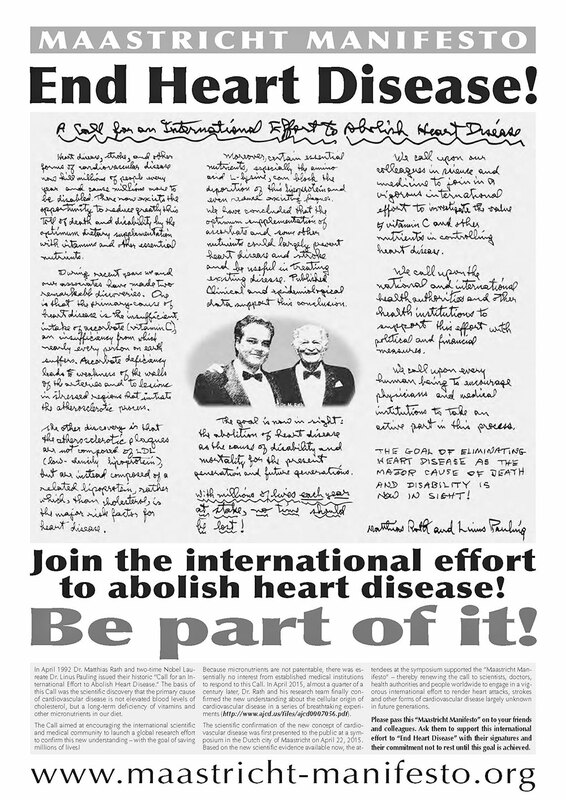 In April 2015, scientists at the Dr. Rath Research Institute in California published a groundbreaking study (Hypoascorbemia Induces Atherosclerosis and Vascular Deposition of Lipoprotein(a) in Transgenic Mice) in the American Journal of Cardiovascular Disease proving that heart disease is an early form of the vitamin C deficiency disease scurvy. Building on a discovery made by Dr. Matthias Rath in the early 1990s, the publication of this research dealt a major blow to the cholesterol theory of heart disease and the Pharma Cartel's sales of cholesterol-lowering drugs. As Dr. Rath's work has shown, coronary heart disease occurs for precisely the same reason that clinical (early) scurvy does - a deficiency of vitamin C in the cells composing the artery wall. Unlike animals, humans develop heart disease because their bodies cannot produce vitamin C. While the average human diet provides enough vitamin C to prevent scurvy, this is not enough to guarantee stable artery walls. As a consequence of the insufficient supply of vitamin C, millions of tiny cracks and lesions develop in the artery walls. Subsequently, cholesterol, lipoproteins, and other risk factors enter to repair this damage. Of all these risk factors, by far the most important is a molecule known as Lipoprotein(a). Primarily found in humans and sub-human primates, Lipoprotein(a) functions as a repair molecule compensating for the structural impairment of the vascular wall. In general, animals that produce vitamin C in their bodies do not produce Lipoprotein(a). In human beings, in the case of a chronic deficiency of vitamin C, the arterial repair process becomes continuous. Over the course of many years, atherosclerotic deposits develop. This eventually leads to the occurrence of heart attacks and strokes. 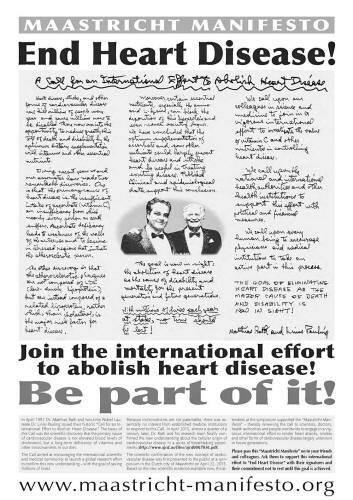 "Call for an International Effort to Abolish Heart Disease". Today, it is becoming increasingly clear that the possibility of eliminating heart disease as the major cause of death and disability is closer than ever before.